Last month we lost the great jazz musician Al Jarreau, but as I noted in his obituary, the general public would not class him as jazz. On the late seventies he made his sound more commercial and that’s when he became commercially acceptable. The same goes for both George Benson and the band that provides this week’s Single of the Week subject – Earth Wind and Fire. 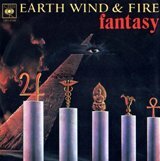 Over the years more than 50 musicians have passed through the ranks of the band, but this week I look at their second UK hit, Fantasy from 1978 of which the line up at the time was vocalist Maurice White and Philip Bailey, Maurice’s brother Verdine (bass), Larry Dunn (keyboard), Johnny Graham (lead guitar), Al McKay (rhythm guitar), Andrew Woolfolk (sax and flute) and drummers Fred White (another brother of Maurice’s) and Ralph Johnson. One thing that gave the band their distinctive sound is an African instrument that Maurice discovered call the Kalimba. It is an African hand-held thumb type keyboard and is a modern addition to the ancient African lamellaphones family of instruments. Its name fascinated Maurice as he named an interlude called Kalimba Tree after it as the opening track on side two of their 1981 album Raise. The band scored 15 further UK hits including September, Boogie Wonderland (alongside Maurice’s protégé group The Emotions), After the Love Has Gone and Let’s Groove through to 1984 when they took a three year hiatus. They returned in 1987 with five original members still intact. In 1989 Maurice was diagnosed with Parkinson’s disease which stopped him touring, but he retained executive control of the band up until in death in February 2016. The current line-up still includes three original members – Philip Bailey, Verdine White and Ralph Johnson – Bailey’s son is also now a member of the band and plays percussion as well backing vocals. I was lucky enough to see them at Hammersmith in 1981 and again at the o2 just a few months ago and they still a great live attraction with the same sound and energy they’ve always had. The highlight for me was that Philip Bailey’s falsetto voice, which, at the age of 65, is still crystal clear and can still get all the high notes. He even does a 10 minute acapella falsetto set which was mesmerising. Fantasy is a song few would have the guts to cover, but Black Box, with Martha Wash on lead vocals, brought it to a new audience in 1990 and took it to number five. Following 9/11, Earth, Wind & Fire performed at a benefit concert in Virginia to raise money for the American Red Cross. The show raised $25,000 for the charity. They also performed at the closing ceremonies for the 2002 Winter Olympics in Salt Lake City, Utah. President Obama was a fan too because in 2009, by invitation, they became first musical acts to play at the White House since Obama took office.